I read this interesting article on the differential in time between wetsuit and non-westuits in ocean swim races. Apparently it’s a pretty complicated topic! I hadn’t given it a whole lot of thought before reading the article but ti certainly has me thinking now. I’ve never worn a wetsuit in a race. I certainly wear one to train during winter and I’ve written before about the decision of whether or not to wear one when training, but I tend to compete in summer in a climate where it’s warm enough that a wetsuit would actually have me overheating. for the 2012-13 season, though, I have in my head a goal swim that’s later in the year and longer than swims I’ve done previously. That race has both wetsuit and non-wetsuit divisions. It’s literally months and months away and so much work and preparation will need to go into getting ready. Here’s another decision to add to the list! If you’ve read about how I got here, you’ll know it started because of a fantastic program called CanToo, who help people with achieving their fitness goals while fundraising for Cure Cancer Australia. Well, the good news is that registrations open today for the 2012 Can Too Swim program! There are a couple of exciting new locations and sessions on offer to give even more flexibility around people’s other commitments. The even better news is that this year I will be acting as a mentor for one of the training groups! I’m really excited and sure that this will give me a whole new perspective on how to get started and what people want to know. I’ll be in the Wednesday 6.30 group training at the lovely, scenic, outdoor Andrew Boy Charlton Pool. Any old friends or interested newbies…get yourself signed up! The bad news is that my eyes were accosted by a pantsless homeless man on my way to work this morning. I’m still recovering from the trauma! Consistency is important in training. Last night was the first time I’ve done a proper pool session in two weeks thanks to this cold, and my god did I feel it. Last time we did pacing drills I was easily keeping to my pace and feeling confident I could start shaving time off each 100m. Last night, I stayed on pace for the first 500m, and then could not get back to it for anything. I felt like I was giving it everything I had and I was still coming in at least 5 seconds under for each 100m! It felt rough at the time, but I try to use the lesson in a positive way, to remind myself that the opposite can also be true for me – if I can train consistently, I will improve. With a short rest before starting, and enough concerted effort to make me breathless and a little bit nauseous, I managed to come in under for my final 100m, though, so I still have faith that I might be able to shave some seconds off my time trial next week. Watch this space…. Wow, another cracker of a day today….although not without its unique challenges…..
My cold and chest infection seem to have properly passed now…at least with the help of a final cold and flu tablet an hour before the swim, just to keep the snot levels under control! 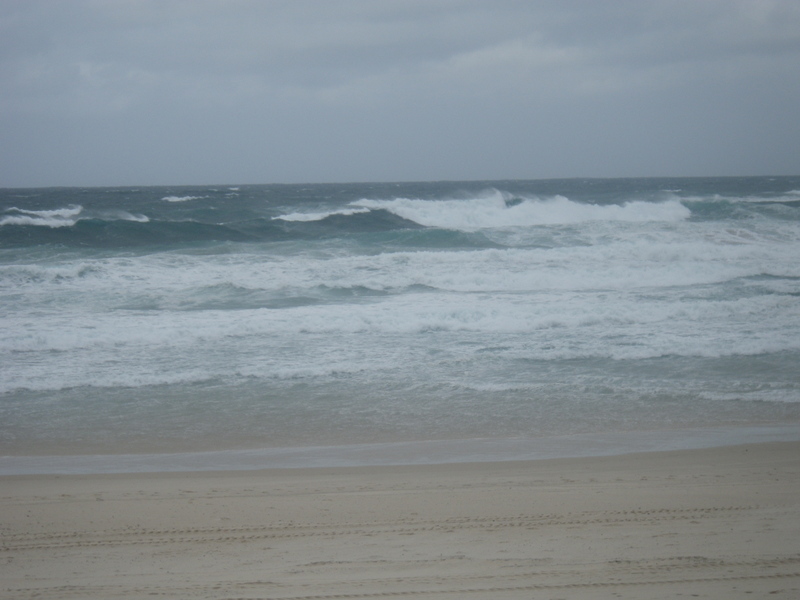 Conditions were very similar to last week at the outset. Practically no waves, sunshine and crisp but not freezing water temperature. We did a kind of unusual point to point…more like a “V” shape for the faster swimmers starting from the middle of the beach, diagonally to the south point, back to the middles, then repeat to the north point (with a bit of an adventure around the end for fun)..
For the slower amongst us, we took off directly from the south end of the beach and headed straight out to the point…exactly where we’d been the same time last week. Soon we noticed something was quite different. It seemed, initially like there were clouds in the water that were like swimming through cellophane noodles! 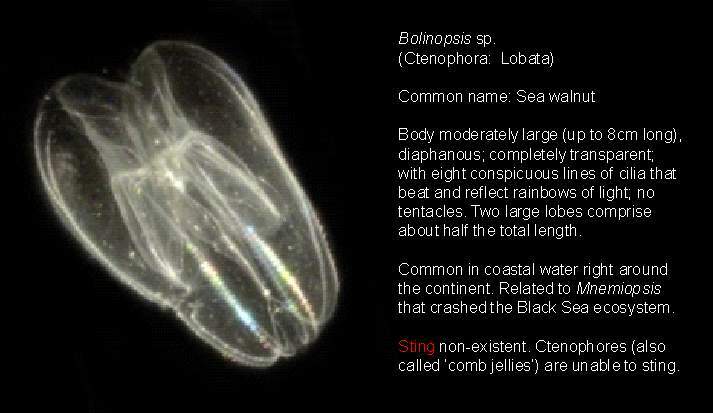 Longish, clear jelly-like things! Yup, something was up with the jellies. I tried doing a bit of research and I still don’t know what on earth was going on. The swarms were thicker in the shallower water over the rocks, and definitely thinned out in the colder currents, but that’s as much as I know. I don’t know what they were, or whether they drifted in or were spawning or what! They weren’t stinging, so that was a bonus, but it was a little freaky at times. In amongst the clear jellies were some familiar looking bigger jellies, a bit of googling seems to identify as sea walnuts, and some really beautiful lacy small white round things that I have had no luck whatsoever at identifying. Just goes to show that you never know just what you’re going to find week to week even swimming at a relatively small beach at the same time once a week. I’ve been doing ti for two years now, and I’ve literally never seen anything like it. 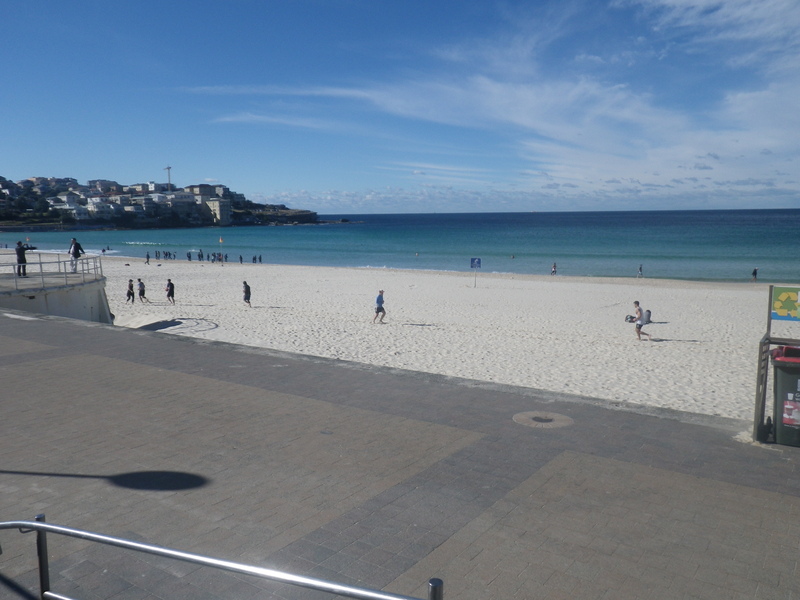 It also makes you realise that whilst we often think of Bondi in a very urban, human sense a lot of the time, when you’re out there you realise that it is very far from being truly our domain. They weren’t stinging or bothering us, but I was certainly making a pretty concerted effort to avoid accidentally swallowing any seawater and risking an mouthful of invertebrates. I’m a vegetarian after all! That being said, although I had my camera on me, I wasn’t feeling particularly inclined to stop swimming and take happy snaps in the middle of fields of jellyfish! Later in the session we headed up to the North end of the beach and were frolicking jellyfish-free at the boat ramp, I did get another chance to take advantage of the amazing water clarity and stunning light (and a couple of new willing models) to work on my underwater photography technique. Plus Allison had a go too, to actually manage to get a few shots of me getting my mermaid on! Check it out in the gallery below…..
Group underwater shot – kind of hard to coordinate…. Embarrassing…me demonstrating the additional buoyancy of a wetsuit…makes it hard to dive! Cough, cough, sniff, sniff…I’ve been laid low with the dreaded flu and have no swimming (or anything not involving coughing or blowing my nose) to report for the last week; hence the radio silence around here! I did try to swim last Saturday….it was as sunny and flat as I’ve ever seen it. Truly “Lake Bondi”. Conditions Could not have been any more different from the previous week….. The rest of the crew did the gorgeous swim from South Bondi to Tamarama around the heads and back and I’m a bit gutted to say I really wasn’t up to going along. I swam out to the point and the back along the rocks and sea-grass at the south end. It was quite lovely…lots of fishies and even a real life snorkeler in the wild! Not as good as a swim to Tamarama and back though. These sunlight “fingers” were particularly prominent! A very unflattering self-portrait. Yikes! I found a lost pair of sunglasses here! It was actually kind of fun to be able to take a bit of time to take some decent photos. Usually I’m swimming hard and trying to keep up with the pack so don’t have time to take photos of much but the basics or when we’re stopped. This gallery is kind of the first time I’ve felt like I’ve captured a little taste of what we see when we swim. For anyone interested, these are all straight out of the camera…not a touch of post-processing was needed! Poor Ronene has also been left high and dry by her calf injury…although she’s been getting disapproving looks from me pretty regularly as she has refused to seek medical advice on the matter. But the good news is that it looks as though both of us should make it back in the water tomorrow, and it looks like it should be a cracker of a day! There have been reports of dolphins and even a random Manta Ray off Cronulla last week…so I have my fingers crossed. The regular Time Trial (TT) in the pool helps to measure your improvement from the training you have been doing. At the last TT 56% of people improved their time over 500m. That is a fantastic result. We’d like to see this trend continue! Usually the TIme Trial in the pool comes as a surprise, but training for a specific goal is effective in increasing your motivation and enjoyment of training. Imagine if we all set our selves a goal of swimming at least 5 seconds faster at our next time trial. That seems very achievable – 1 second faster per 100m. To achieve an improvement is performance we need a plan. On Tuesday I had plans, but they were with Fiona who fully understands the importance of swimming, so I rescheduled and trundled off to the pool for an extra session. Last year I was doing 3 sessions a week plus boxing all winter, so really it’s just back to the same for me, rather than adding an extra session altogether. The session was quite different in a couple of ways. For a start, the coaches were swimming with us. Usually at least one of them stays out of the water to answer questions and provide directions and offer feedback and advice. In this case, too, the session, what it would involve, and what it was designed to achieve was fully spelled out beforehand. These sessions are quite simply designed to get us used to swimming a certain pace consistently without burning out too quickly or tailing off too much at the end. This is harder than you’d think. For a start, I had a new watch and just could not seem to figure out how to get it to work properly to time my laps. In the end I had to just stop playing with it and took note of the time and did the sums in my head. Hoping this will improve with time. Making this more difficult is the fact that I’ve found with swimming (and particularly when I box) thatI become less and less able to deal with numbers the more tired I get. I find this particularly funny given it’s my job to work with numbers every day…and give me an hour at the pool or punching, and I can’t add two and two together! Still, with 4 weeks of focus, I’m hoping that I’ll be able to get the hang of it. Watch this space…my time trial was a full 30 seconds slower than I did for one in February this year, so with a bit of focus and strategy I’m hoping for big results! After I made a fuss and wrote a dramatic post about dangerous conditions on Saturday, I guess I should probably post an update to let you all know how it went. So the answer is good. And then not so good. But not because of what you’d think. The weather was a rough as expected. The waves were pretty big, although not as big as forecast. The sweep of the undertow, though, had some serious power to it. We didn’t go out far because of the weather, as you really couldn’t get out behind the break anyway, so we did ins and outs. Lots of wading through water between knee and waist height. That was hard enough work, let me tell you. More than once I was literally knocked off my feet and there were time we would be swept backwards instead of the way we were trying to swim (well, I was, anyway). It was definitely time to fall back on all the things I talked about in my post on tips for rough day swims. The other thing that was really important in the conditions we had on Saturday is the ability to porpoise. This is a manoeuvre we use in ocean swimming when it’s shallow enough, where we channel our inner porpoise-spirit-animal and push off the bottom, dive under, pull our feet up under us to spring off the bottom and repeat. It’s a really efficient way to cut through the water and move forward even when there’s a current pulling you back (or sideways for that matter). “1. When the gun goes off, run to the point where you are about knee deep in the water. 2. Bend your knees, lean forward, and do a shallow porpoise dive, with arms and hands extended, into the water. Send your hands and body FORWARD, not down. Keep your head tucked between your shoulders. You can peek up a bit with your eyes (not your whole head!) to see where you�re going. Let your body glide in streamline until your hands hit the sand or bottom. STREAMLINE is the key word here. Let your body sail through the water and think about how much less RESISTANCE you are encountering than your competitors who are RUNNING! 3. Use your hands and arms to support your body as you gather your legs up, plant your feet, and get ready for another porpoise dive. You might need to balance on one knee before you can get both feet planted for a new dive. You�ll be in deeper water this time, so dive up and over the water, sending your body FORWARD. 4. Glide in streamline as your hands head down to the sand to catch yourself and prepare for another dive. 5. When you reach water that is about chest deep, take a last, strong porpoise dive and START SWIMMING. You�ll probably find that you got to deep water slightly ahead of the RUNNERS, that you had MORE FUN getting there, and that you started swimming with a BIG BOOST OF POWER from your final porpoise dive. Cool. 1. Swim until you are about waist deep in the water. CAUTION: Water depth is deceptive when you�re horizontal. Your tendency will be to start porpoising too soon, when the water is too deep. This is NOT fun or fast, so swim till your fingertips can almost touch the bottom on your pull or until you think you can easily stand up and sweep your arms out over the water. 2. Stand up, plant your feet, and dive up and over the water. 3. Glide in streamline till your hands hit the sand. 4. Get your feet up under you and porpoise again. Unfortunately, the session wasn’t without incident. Ronene managed to damage her calf muscle. Ironically (in the Alanis Morisette way, ok) running up the beach and not swimming in the rough conditions, while we were doing a few show-off shots out of the big surf for a newspaper photographer taking a few snaps. No sign of the publicity shots in the social pages yet, but poor Ronene had to get carried off the beach and helped out by the wonderful Bondi Rescue lifeguards. A bit shout out to those guys – they really went above and beyond! Looks like she’s on crutches and potentially out of action for a bit. Fingers crossed for a speedy recovery.